R® is a registered trademark. The Defense Centers of Excellence for Psychological Health and Traumatic Brain Injury is interested in determining the efficacy and comparative effectiveness of integrative medicine approaches for several health conditions. This systematic review assesses the safety and efficacy of mindfulness meditation as an intervention to alleviate chronic pain. The review will be of interest to military health policymakers and practitioners, civilian health care providers, and policymakers, payers, and patients. None of the authors has any conflicts of interest to declare. This research was sponsored by the Defense Centers of Excellence for Psychological Health and Traumatic Brain Injury and conducted within the Forces and Resources Policy Center of the RAND National Defense Research Institute, a federally funded research and development center sponsored by the Office of the Secretary of Defense, the Joint Staff, the Unified Combatant Commands, the Navy, the Marine Corps, the defense agencies, and the defense Intelligence Community. For more information on the RAND Forces and Resources Policy Center, see http://www.rand.org/nsrd/ndri/centers/frp.html or contact the director (contact information is provided on the web page). small sample sizes and lack of statistical power. Additional trials with adequate power, greater efforts to prevent attrition, monitoring of adherence to meditation practice, active collection of adverse events, and better reporting of methods are suggested. Introduction Chronic pain, often defined as pain lasting longer than three months or past the normal time for tissue healing, can lead to significant medical, social, and economic consequences; relationship issues; lost productivity; and larger health care costs. The high prevalence and refractory nature of chronic pain and the negative consequences of pain medication dependence drive investigation of innovative treatment modalities. Patients who seek a treatment plan for chronic pain that includes more than just medication are increasingly turning to complementary, alternative, and integrative medicine. One such modality that pain patients are using is mindfulness meditation. Based on ancient Eastern meditation practices, mindfulness is characterized by paying attention to the present moment with openness, curiosity, and acceptance. Previous systematic reviews on mindfulness meditation for chronic pain have been promising, but evidence was of low quality and additional studies have been completed since that time. This systematic review aims to synthesize evidence from trials of mindfulness meditation interventions to provide estimates of its efficacy in treating chronic pain (PROSPERO 2015:CRD42015025052). This report may be used by committees charged with updating U.S. Department of Veterans Affairs and Department of Defense guidelines for treatment of chronic pain. KQ 1: What are the efficacy and safety of mindfulness meditation interventions, as an adjunctive or monotherapy, for adults with chronic pain due to migraine, headache, back pain, osteoarthritis, or neuralgic pain compared with treatment as usual, waitlists, no treatment, or other active treatments? − KQ 1a: Does the effect vary by the type of mindfulness meditation intervention? − KQ 1b: Does the effect vary by medical condition targeted (migraine, headache, back pain, osteoarthritis, or neuralgic pain)? − KQ 1c: Does the effect differ when the intervention is offered as an adjunctive therapy rather than as a monotherapy? − KQ 1d: Does the effect vary depending on the duration and frequency of mindfulness meditation (i.e., dose effect)? Methods To answer our key questions, we conducted a systematic search of electronic databases— PubMed, CINAHL (Cumulative Index to Nursing and Allied Health Literature), PsycINFO, and CENTRAL (Cochrane Central Register of Controlled Trials)—as well as bibliographies of existing systematic reviews and included studies, to identify reports of randomized controlled trials (RCTs) testing the efficacy and safety of mindfulness meditation used adjunctively or as monotherapy to treat adults with chronic pain. Two independent reviewers screened identified literature using predetermined eligibility criteria, abstracted pre-specified study-level information, and assessed the quality of included studies. Outcomes of interest included changes in pain symptomatology, use of analgesics, functional status, health-related quality of life, functional impairment (disability measures), and adverse events. Meta-analyses for efficacy outcomes were conducted using the Hartung-Knapp-SidikJonkman method for random-effects models to estimate the relative risk (RR), standardized mean differences (SMDs), and 95-percent confidence intervals (CIs). We abstracted any adverse events reported. The quality of evidence was assessed using the Grades of Recommendation, Assessment, Development, and Evaluation (or GRADE) approach. analyses also showed that changes in pain outcomes for patients with back pain (p=0.28), headache (p=0.69), and fibromyalgia (p=0.24) were not significantly different from outcomes for patients with other types of pain. The quality of evidence is low for migraine and back pain, and moderate for fibromyalgia. Key Question 1c The effect of meditation on pain did not differ systematically when offered as a monotherapy compared with as an adjunctive treatment. The effect was not significant for both monotherapy (SMD 0.21; CI −0.02, 0.45; 13 RCTs; I2 55%) and adjunctive treatment (SMD 0.36; CI −0.16, 0.89; 11 RCTs; I2 73.5%). A meta-regression found that pain outcomes did not differ significantly between interventions using mindfulness meditation as monotherapy or adjunctive therapy (p=0.53). The quality of evidence is low for mindfulness meditation as monotherapy and as adjunctive therapy. Key Question 1d The efficacy of mindfulness meditation did not differ systematically by frequency or duration of the treatment. In a meta-regression, efficacy did not vary significantly as program duration in weeks increased (p=0.12). The effect was not significant at a dose of less than one hour a week (low frequency; SMD −0.18; CI −0.49, 0.10; 3 RCTs; I2 0%), or at a dose of one to four hours a week (medium frequency; SMD 0.44; CI −0.16, 1.05; 10 RCTs; I2 77.5%). The effect for interventions requiring greater than four hours a week (high frequency) bordered on statistical significance (SMD 0.19; CI 0.00, 0.39; 11 RCTs; I2 4.5%), but the confidence intervals fit within those of the results for interventions requiring one to four hours of participation. A metaregression found that pain outcomes did not differ significantly between low frequency (p=0.17) or medium frequency (p=0.32) and high frequency interventions. The quality of evidence is low for doses of less than one hour a week and one to four hours a week; the quality of evidence is moderate for more than four hours of practice a week. Conclusions Mindfulness meditation was associated with a small effect of improved pain symptoms compared with control groups in a meta-analysis of 24 RCTs. However, there was evidence of substantial heterogeneity among studies, resulting in a low quality of evidence for this outcome. Mindfulness meditation statistically significantly improved depression, physical health-related quality of life, and mental health-related quality of life; pooled analyses included ten, 12, and 13 studies, respectively. Those analyses detected less heterogeneity, so our confidence in the results is higher; quality of evidence was high for depression and moderate for physical and mental health-related quality of life. Adverse events in the included RCTs were rare and not serious, but the vast majority of studies did not collect adverse event data. As reports of psychosis during meditation have appeared in the medical literature, we strongly suggest that future trials actively collect adverse event data. Many trials were of poor quality. Due to the low quality of evidence supporting improved pain outcomes, additional trials are needed to increase confidence in this finding. These trials must have adequate power, greater efforts to prevent attrition, and better reporting of methods. This research is sponsored by the Defense Centers of Excellence for Psychological Health and Traumatic Brain Injury (DCoE). We gratefully acknowledge Kristie Gore for her support and guidance throughout the project. We also would like to thank our project officers and points of contact at DCoE—Chris Crowe, Marina Khusid, and Michael Freed—for their support of our work. In addition, we thank Daniel Cherkin and Thomas Concannon for reviewing the report and offering helpful suggestions. Any errors of fact or interpretation in this report remain the responsibility of the authors. 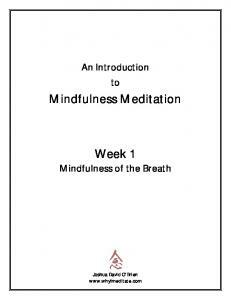 Description In addition to mindfulness meditation, MBSR involves teaching of body scan or yoga to encourage open, nonjudgmental observation and acceptance of painful or unpleasant sensation, negative thoughts, or emotions instead of cognitively appraising them and increasing anticipatory anxiety, avoidance, or other maladaptive patterns. In addition to mindfulness meditation, mindfulness-based relapse prevention teaches relapse prevention skills and nonjudgmental, open, and acceptant observation of cravings. It aims to decouple (1) the negative thoughts and emotions that are associated with cravings and (2) relapse. In addition to mindfulness meditation, mindfulness training for smoking provides targeted training in how to apply mindfulness to smoking relapse determinants, such as smoking triggers, strong emotions, addictive thoughts, urges, and withdrawal symptoms. In addition to mindfulness meditation, mind-body bridging and mindfulness-based therapy for insomnia use behavioral strategies to reduce night wakefulness. In addition to mindfulness meditation, MORE teaches neutral, open, and acceptant observation of painful sensations. It also incorporates positive psychology and behavioral techniques directed toward neuroscientific underpinnings of addiction. medicine interventions for conditions such as substance abuse, major depressive disorder, and posttraumatic stress disorder. These reviews may be used by committees charged with updating Department of Veterans Affairs and Department of Defense guidelines for treatment of these conditions. We performed a systematic review to identify RCTs testing the efficacy and safety of mindfulness meditation for chronic pain. The systematic review protocol is registered in PROSPERO, an international registry for systematic reviews. Sources We searched the electronic databases PubMed, CINAHL (Cumulative Index to Nursing and Allied Health Literature), PsycINFO, and CENTRAL (Cochrane Central Register of Controlled Trials) for English-language RCTs. In addition to this search and the reference-mining of all included studies identified through it, we reference-mined prior systematic reviews related to this topic and retrieved all studies included therein. Search Strategy The search strategy was developed by the chief reference librarian for RAND’s Knowledge Services, informed by search results of an environmental scan of the literature at the initiation of this study (as part of unpublished RAND research by Melony Sorbero, Sean Grant, and Susanne Hempel) and existing reviews. The search strings are presented in Appendix A. We searched from the inception of the databases through June 2015.
adjunctive versus monotherapy, and that compare two or more mindfulness meditation interventions were included. Outcomes: Studies that reported patient pain measures—including pain assessed with a visual analog scale (VAS), the SF-36 pain subscale, the McGill Pain Questionnaire (MPQ), and so on—and studies reporting on change in analgesic use were included. Timing: Studies could involve any treatment duration and any follow-up time period. Setting: Studies were not limited by setting. Study design: Included studies were limited to parallel group, individually-randomized, or cluster-randomized controlled trials. Inclusion Screening Two independent reviewers (the project lead, who is an experienced systematic reviewer and former Associate Director of the Southern California Evidence-based Practice Center [EPC], and a RAND research assistant with experience in systematic reviews) independently screened titles and abstracts of retrieved citations following a pilot session to ensure similar interpretation of the inclusion and exclusion criteria. Citations judged as potentially eligible by one or both reviewers were obtained as full text. The full-text publications were then screened against the specified inclusion criteria by the two independent reviewers; any disagreements were resolved through discussion within the review team. The flow of citations throughout this process was documented in an electronic database, and reasons for exclusion of full-text publications were recorded. A list of excluded publications is shown in Appendix B. Timing: time-points of outcome assessment, timing of intervention Setting: geographic region, clinical setting, interventionist training Study design: aim of study, definition of chronic pain, inclusion and exclusion criteria, sample size, reported power calculations, items relevant to risk of bias and quality ratings. If different reports appeared to be from the same study, descriptions of participants were compared to ensure that data from the same study populations entered the analysis only once. For each included study, findings are displayed in an evidence table (see Appendix C) that includes details about the intervention, specific comparisons, and outcomes measured. Good: Comparable groups are initially assembled and maintained throughout the study with at least 80-percent follow-up; reliable, valid measurement is used and applied equally to all groups; interventions are clearly described; all important outcomes are considered; appropriate attention is given to confounders in analysis; ITT analysis is used. Fair: One or more of the following issues is found in the study: some, though not major, differences between groups exist at follow-up; measurement instruments are acceptable but not ideal, though are generally applied equally; some but not all important outcomes are considered; some but not all potential confounders are account for in analyses. ITT analysis must be done. Poor: One or more of the following “fatal flaws” is found in the study: initially assembled groups are not comparable or maintained throughout the study; unreliable or invalid measurements are used or applied unequally across groups; key confounders are given little to no attention in analyses; ITT analysis is not used. Data Synthesis The primary aim of this systematic review was to identify whether mindfulness meditation for chronic pain in adults is effective and safe. As such, when sufficient data were available and statistical heterogeneity was below agreed thresholds (Higgins and Green, 2011), we performed meta-analysis to pool efficacy results across included studies for the outcomes of interest, and we present forest plots for these meta-analyses. We used the Hartung-Knapp-Sidik-Jonkman method for random-effects meta-analysis (Hartung, 1999; Hartung and Knapp, 2001; Sidik and Jonkman, 2006) to estimate the relative risk (RR), standardized mean differences (SMDs), and 95-percent confidence intervals (CIs). This approach may be preferred when the number of studies pooled is small and when there is evidence of heterogeneity (IntHout, Ioannidis, and Borm, 2014), and it has been shown that the error rates are more robust than the previously used DerSimonian and Laird method (Sanchez-Meca and Marin-Martinez, 2008). For studies reporting multiple pain outcomes, we used specific pain measures, such as the MPQ for the main meta-analysis rather than the pain subscale of the SF-36, and average or general pain measures rather than situational measures, such as pain right at the time of assessment. Adverse events were classified and grouped according to the Common Terminology Criteria for Adverse Events system. Due to the small number of adverse events reported, quantitative analysis was not conducted. In addition, we described results of head-to-head comparisons and conducted subgroup analyses and meta-regressions to address secondary questions of this systematic review. Specifically, we examined whether there were differences in effect sizes between different mindfulness meditation interventions; studies conducted in different population groups (e.g., patients with headache, migraine, back pain, or pain due to osteoarthritis); and mindfulness meditation intervention as monotherapy versus an adjunctive therapy. Given the complexity of the topic, subgroup and sensitivity analysis was performed only for those outcomes with sufficient data. For meta-analysis of data with clear outliers, sensitivity analysis was conducted (excluding the outliers), if appropriate (Hamling et al., 2008). We also conducted sensitivity analyses omitting the lower quality studies for major comparisons. High indicates that the review authors are very confident that the effect estimate lies close to the true effect for a given outcome, as the body of evidence has few or no deficiencies. As such, the reviewers believe the findings are stable. That is, further research is very unlikely to change confidence in the effect estimate. Moderate indicates that the review authors are moderately confident that the effect estimate lies close to the true effect for a given outcome, as the body of evidence has some deficiencies. As such, the reviewers believe that the findings are likely to be stable, but further research may change confidence in the effect estimate and may even change the estimate. Low indicates that the review authors have limited confidence that the effect estimate lies close to the true effect for a given outcome, as the body of evidence has major or numerous (or both) deficiencies. As such, the reviewers believe that additional evidence is needed before concluding either that the findings are stable or that the effect estimate lies close to the true effect. Very low indicates that the review authors have very little confidence that the effect estimate lies close to the true effect for a given outcome, as the body of evidence has very major deficiencies. As such, the true effect is likely to be substantially different from the estimated effect; thus, any estimate of effect is very uncertain. Summary of Findings Review findings are summarized in a table organized by outcomes that reflect the key questions for this systematic review (Table 4.1). This table lists the intervention and comparators evaluated; the outcomes assessed for each type of comparison; the number of studies and number of participants included for each outcome assessment; the direction and magnitude of the effect for each outcome; and the quality of the evidence for each outcome. For each outcome, results of pooled analyses are described first, followed by narrative descriptions of individual studies not included in the pooled analyses (if any). Findings are first reported for the broad comparison of mindfulness meditation compared with any comparison group. Findings are then reported separately by intervention (e.g., MBSR), population (e.g., patients with headache, back pain, fibromyalgia), therapy characteristic (i.e., monotherapy, adjunctive therapy), and type of comparator. Meta-analyses results are displayed in figures to allow a transparent overview, and results are described in detail in the text. Results of the Search We identified 639 citations through searches of electronic databases, plus nine citations by reference-mining previous systematic reviews (see Figure 3.1). Full texts were obtained for 88 citations identified as potentially eligible by two independent reviewers. In total, 60 articles were excluded at the full-text stage because they did not meet eligibility criteria. Ten of these studies were excluded because they were off topic, not reporting on mindfulness or chronic pain. Five were excluded due to intervention, as they did not study mindfulness meditation. Thirteen did not report on pain or analgesic use outcomes. Eleven were not RCTs. Five of the publications were dissertations, nine were conference abstracts, and five reported on studies already in the database and did not present new data. One study could not be obtained to be assessed for eligibility, and one publication was retained for background only. Appendix B lists excluded publications, with reasons for exclusion. Twenty-eight RCTs met inclusion criteria. Details of these studies are displayed in the evidence table in Appendix C.
What are the efficacy and safety of mindfulness meditation interventions, as an adjunctive or monotherapy, for adults with chronic pain due to migraine, headache, back pain, osteoarthritis, or neuralgic pain compared with treatment as usual, waitlists, no treatment, or other active treatments? 28 RCTs • 8 treatment-as-usual comparator • 8 passive comparator • 9 education/support group comparator • 1 stress management comparator • 1 cognitive behavioral therapy comparator • 1 massage comparator • 1 multidisciplinary pain intervention comparator • 1 muscle relaxation/stretching comparator • 1 nutritional information/food diary comparator Note: Some trials have two comparison arms. 3 RCTs report on adverse events. Does the effect vary by the type of mindfulness meditation intervention? Does the effect vary by medical condition targeted (migraine, headache, back pain, osteoarthritis, or neuralgic pain)? 8 fibromyalgia 6 migraine or other headache 4 back pain 2 osteoarthritis 3 rheumatoid arthritis 1 cancer 3 irritable bowel syndrome 6 other conditions 4 unspecified conditions Note: Categories are not mutually exclusive. Does the effect differ when the intervention is offered as an adjunctive therapy rather than as a monotherapy? Does the effect vary depending on the duration and frequency of mindfulness meditation (i.e., dose effect)? headache, four studies examining back pain, two studies examining osteoarthritis, three studies examining rheumatoid arthritis, one study examining cancer, three studies examining irritable bowel syndrome (IBS), six studies examining other conditions, and four studies examining unspecified conditions. (Categories are not mutually exclusive; some studies did not limit enrollment to a particular medical condition or source of pain.) For KQ 1c on whether mindfulness meditation is more effective as monotherapy than as an adjunctive treatment, we found 13 studies examining meditation as monotherapy, 13 examining it as adjunctive therapy, and two that were unclear. For KQ 1d on whether the effect of mindfulness meditation varied by the frequency and duration of the intervention, we found that the duration varied from three to 12 weeks (median eight weeks) and that the frequency (defined as the total time spent in group sessions, remote sessions, and “homework”) varied from less than one hour a week in two studies to more than four hours a week in ten studies. Two studies examine programs estimated at less than one hour per week (i.e., low frequency), nine studies examined programs estimated at one to four hours per week (i.e., medium frequency), ten studies examined programs estimated at more than four hours per week (i.e., high frequency), and seven studies were unclear. al., 2010; Meize-Grochowski et al., 2015; Morone et al., 2009; Omidi and Zargar, 2014; PlewsOgan et al., 2005). Three studies were judged poor primarily due to unclear methods (Rahmani and Talepasand, 2015; Teixeira, 2010; Wong, 2009). Random sequence generation. Ten studies had unclear selection bias because they did not report their random sequence generation method; 18 other studies reported adequate random sequence generation methods (e.g., computerized random generator) so were at low risk for selection bias. Allocation concealment. Thirteen studies had unclear selection bias because they did not report their allocation concealment method, whereas 14 studies did give a method of allocation concealment, and one other study presented a method of allocation concealment that was at high risk of being inadequate. Blinding of participants and providers. All but two studies were rated high risk on this domain, as it is almost impossible to blind participants to meditation interventions. One study had low risk of bias because the authors used sham meditation as the control. The remaining study had unclear selection bias because the authors did not report the method of ensuring blinding. Blinding of outcome assessors. Ten studies had unclear risk of detection bias because they did not report whether outcome assessors were blind to participant intervention conditions. Six studies had low risk of bias, because the authors explicitly indicated that the outcome assessors were blind to intervention assignment, and 12 studies had high risk of bias, indicating assessors were not blinded. Outcome data. Twenty studies had low risk of attrition bias; seven had high risk due to attrition of more than 20 percent at follow up, and one study was unclear. Selective outcome reporting. Two of the studies had high risk of reporting bias. Nine studies had low risk of reporting bias because the authors cited a protocol for the study. Seventeen studies had unclear risk of bias because it was not possible to determine whether all outcomes collected were reported. Other. Four of the studies were identified as having an unequal distribution among groups of potential confounders at baseline, five studies were found to be unclear in this regard, and 19 studies reported no significant differences in baseline characteristics. None of the studies was a crossover trial, and therefore appropriate washout was not applicable. Only one study was judged to have any problems with having equal, reliable, and valid outcome measurement. One study was found to have issues with clear definitions of the interventions. Seven studies were identified as having problems with appropriate ITT analysis for outcomes with missing data, one study was unclear, and the remaining studies had no indication of problems with ITT analysis. KQ 1: What Are the Efficacy and Safety of Mindfulness Meditation Interventions, as an Adjunctive or Monotherapy, for Adults with Chronic Pain Due to Migraine, Headache, Back Pain, Osteoarthritis, or Neuralgic Pain Compared with Treatment as Usual, Waitlists, No Treatment, or Other Active Treatments? Chronic Pain Treatment Response Standardized Mean Differences Twenty-four RCTs reported continuous outcome data on scales assessing chronic pain in each study arm. Pain scales and comparators varied from study to study (Astin et al., 2000; Brown and Jones, 2013; Cash et al., 2015; Cathcart et al., 2014; Davis and Zautra, 2013; Day et al., 2014; Dowd et al., 2015; Esmer et al., 2010; Garland et al., 2014; la Cour and Petersen, 2015; Meize-Grochowski et al., 2015; Morone, Greco, and Weiner, 2008; Morone et al., 2009; Omidi and Zargar, 2014; Plews-Ogan et al., 2005; Schmidt et al., 2011; Teixeira, 2010; Wells et al., 2014; Zautra et al., 2008; Parra-Delgado and Latorre-Postigo, 2013; Rahmani and Talepasand, 2015; Fjorback et al., 2013; Gaylord et al., 2011; Ljotsson, Falk, et al., 2010). The median follow-up time was 12 weeks, with a range of four to 60 weeks. Although 15 studies indicated that mindfulness reduced pain, many did not report a statistically significant effect, and confidence intervals varied widely between studies (see Figure 3.2). However, the pooled analysis indicates a statistically significant effect of mindfulness meditation (SMD 0.26; CI 0.06, 0.46; 24 RCTs; I2 62.1%). Substantial heterogeneity was detected. Begg’s and Egger’s tests for publication bias were nonsignificant. The difference in the pooled and individual results could also indicate that the majority of studies were underpowered. This possibility is buttressed by the fact that most of the 24 RCTs either reported being underpowered or did not report power. To investigate the effect of methodological quality on these results, we conducted a sensitivity analysis excluding all poor quality studies (not displayed). The results were very similar to our main pooled analysis (SMD 0.21; CI 0.00, 0.42; 15 RCTs; I2 57.2%). Eight RCTs examined the effect of mindfulness meditation on pain compared with education or support groups (Astin et al., 2003; Davis and Zautra, 2013; Garland et al., 2014; Dowd et al., 2015; Morone et al., 2009; Gaylord et al., 2011; Ljotsson, Falk, et al., 2010; Zautra et al., 2008) (see Figure 3.7). The effect of meditation was significant in three of these studies, and not significant when studies were pooled (SMD 0.19; CI −0.11, 0.49; 8 RCTs; I2 63.9%) (Garland et al., 2014; Gaylord et al., 2011; Ljotsson, Falk, et al., 2010). Substantial heterogeneity was detected. The nonsignificant effect remained largely unchanged when poor quality studies were removed from analysis (SMD 0.25; CI −0.16, 0.66; 6 RCTs; I2 71.9%; not displayed). Inclusion Criteria: Female fibromyalgia sufferers Co-interventions: NA aged 18 years and older who were able to attend a weekly group and had a physician-verified diagnosis. Comparator: Passive (e.g., waitlist, no treatment) Exclusion Criteria: Severe mental illness. Inclusion Criteria: Being over 18 years of age, being Co-interventions: NA able to understand written and spoken English, reporting having received a diagnosis of fibromyalgia Comparator: Health tips via the Internet syndrome from a physician, and having daily access to the Internet. Primary Endpoint: Pain Exclusion Criteria: History of more than five past episodes of depression. Intervention Content of Intervention: The 8-week MBCT for headache pain manual was adapted from an existing 8-week MBCT Location: United States or Canada Medical Condition/Type of Pain: Migraine, other for depression protocol. The adapted manual, developed headache by Day and Thorn, incorporated knowledge about the Purpose: To investigate the specific issues of relevance and importance to a feasibility, tolerability, Definition of Chronic Pain: 3 months minimum or headache pain population. 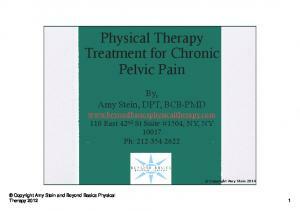 The treatment development acceptability, and initial estimates “past normal time for tissue healing” phase included piloting the manual and treatment of efficacy of MBCT compared approach within a group of patients with heterogeneous with a delayed treatment control Baseline Pain Score: Brief Pain Index (BPI) Intensity chronic pain conditions. for headache pain Intervention Group: 3.59 (SD 1.74); Control Group: 3.37 (SD 2.03) Setting: Outpatient pain clinic Quality Rating: Fair Mean Age: 41.7 (SD 12.0) Dosage, Duration: >4 hours spent in session, homework, and other each week, for 8 weeks Gender (% Male): 11.1 Co-interventions: TAU or standard of care Inclusion Criteria: 19 years of age or older; at least three pain days per month (for the past 3 months or Comparator: Passive (e.g., waitlist, no treatment) longer) due to a primary headache pain type (i.e., migraine, tension-type headache, cluster, or other) Primary Endpoint: BPI Intensity as defined by the International Headache Society; headache pain was the primary source of pain; if Power Calculation: Power insufficient (post hoc test by currently using psychotropic or headache authors) medications, use of these medications must have begun at least 4 weeks before baseline assessment; Follow-Up Time: 8 weeks and reading ability was sufficient to comprehend self-monitoring forms. Exclusion Criteria: Human immunodeficiency virus– related pain and cancer pain, because these are associated with malignant disease; history of seizure or facial neuralgia, as these conditions might preclude the accurate diagnosis of headache; significant cognitive impairment, evidenced by a positive screen on the Mini-cog21; current participation in other psychological treatments for any pain condition; and schizophrenia, bipolar affective disorder, seizure disorder not adequately controlled by medication, or current substance abuse. Intervention Content of Intervention: Based on Kabat-Zinn (2005) MBSR manual. The intervention included psychoeducation, symptom registration, and a model for graded exercise from the STreSS-1 manual. Inclusion Criteria: Chronic (i.e., at least 2 years) of the multi-organ type bodily distress syndrome, which Primary Endpoint: SF-36 Bodily Pain requires functional somatic symptoms from at least three out of four bodily systems—the Power Calculation: Yes (sufficient power) cardiopulmonary, gastrointestinal, musculoskeletal, or general symptoms; moderate to severe Follow-Up Time: 60 weeks impairment in daily living; age 20 to 50 years; absence of severe psychiatric morbidity (i.e., psychotic and bipolar disorders). The patients with comorbid depression and anxiety, and with comorbid medical conditions (e.g., asthma, diabetes) were included if symptoms attributed to these conditions could be clearly differentiated from symptoms due to bodily distress syndrome. Exclusion Criteria: Current alcohol or drug abuse; pregnancy; not fluent in the Danish language (operationalized as non-Scandinavian origin); no informed consent. Mean Age: Intervention: 52 (SD 12); Control: 55 (SD Dosage, Duration: Dosage is unclear, for 8 weeks 13) Co-interventions: TAU or standard of care: Gender (% Male): 12 acetaminophen, rheumatic painkiller, and opioids Inclusion Criteria: Rheumatoid arthritis, according to the 1987 American College of Rheumatology classification criteria. Exclusion Criteria: Prior meditation experience. Intervention Content of Intervention: MORE unites complementary aspects of mindfulness training, third-wave cognitivebehavioral therapy, and principles from positive psychology into an integrative intervention strategy. Techniques drawn from these therapeutic approaches were integrated into a manualized 8-session group intervention designed to address the multiplicity of pathogenic factors involved in chronic pain and long-term opioid use. MORE sessions involved mindfulness training to target automatic habit behavior and foster nonreactivity, positive reappraisal training to regulate negative emotions and foster a sense of meaningfulness in life, and training in savoring pleasant events and emotions to ameliorate deficits in natural reward processing and positive affectivity. Intervention Content of Intervention: The mindfulness-based stress and pain management program was based on the MBSR program developed by Jon Kabat-Zinn and Saki Santorelli at the University of Massachusetts. The basic course was adapted to an IBS population by emphasizing the relevance of mindfulness in coping with IBS-related symptoms and perceptions. Inclusion Criteria: IBS diagnosis according to Rome II criteria and physician diagnosis; female; age 18– 75 years; ability to understand English; willingness to document bowel symptoms and medication use regularly and complete the assessments; and willingness to attend eight weekly sessions, plus one additional half-day session of either mindfulness training or support group. Power Calculation: No Exclusion Criteria: Diagnosis of mental illness with psychosis; a history of inpatient admission for Follow-Up Time: 20 weeks psychiatric disorder within the past 2 years; a history or current diagnosis of inflammatory bowel disease or gastrointestinal malignancy; active liver or pancreatic disease; uncontrolled lactose intolerance; celiac disease; a history of abdominal trauma or surgery involving gastrointestinal resection; or pregnancy. Baseline Pain Score: BPI average score Intervention Group: 19 (SD 6.6); Control Group: 19.2 (SD 5.2) Co-interventions: TAU or standard of care Mean Age: Intervention: 46.52 (SD 12.42); Control: 48.84 (SD 12.20) Gender (% Male): 15 Inclusion Criteria: Chronic pain diagnosis by trained physicians who specialized in treating pain; all pain conditions and physical abilities were included. Exclusion Criteria: Unstable clinical situations, such as pharmaceutical treatments that continued to change, and patients with obvious mental disabilities, such as severe cognitive problems or emotional turmoil; very poor Danish language skills. Co-interventions: Over the counter medication (ibuprofen, Tylenol, acetaminophen, etc. ), opioids, other prescription Inclusion Criteria: Chronic lower back pain of at least medications 3 months’ duration and of at least moderate intensity according to a vertical verbal descriptor scale (pain Comparator: Over the counter medication (ibuprofen, thermometer), age ≥65 years, and intact cognition Tylenol, acetaminophen, etc. ), opioids, other prescription (Mini-Mental Status Exam ≥24). medications, health education program Exclusion Criteria: Non-English speaking, previous participation in a mindfulness meditation program, serious hearing or vision impairment that would preclude responding to questionnaires or participating in the meditation program, medical instability from heart or lung disease, multiple recent falls or inability to stand independently, pain caused by an acute injury in the previous 3 months, and underlying red flags of serious underlying illness, such as recent unexplained weight loss, fever, or sudden worsening of back pain. Setting: Unclear Mean Age: Intervention: 74.1(SD 6.1); Controls: 75.6 (SD 5.0) Dosage, Duration: >4 hours spent in session, homework, and other each week, for 8 weeks Gender (% Male): 43 Co-interventions: NA Inclusion Criteria: (1) Were 65 years of age or older; (2) had intact cognition (Mini-Mental Status Exam Comparator: Passive (e.g., waitlist, no treatment) P23); (3) had chronic low back pain, defined as moderate pain occurring daily or almost every day Primary Endpoint: Adherence for at least the previous three months; and (4) spoke English. Power Calculation: Power insufficient (post hoc test by authors) Exclusion Criteria: Had previously participated in a mindfulness meditation program and had ‘‘red flags’’ Follow-Up Time: 8 weeks suggestive of serious underlying illness (e.g. malignancy, infection, unexplained fever, weight loss, or recent trauma) causing their pain. Inclusion Criteria: Having a tension headache according to the International Headache Classification Subcommittee, and tending to participate in the study. Exclusion Criteria: A medical diagnosis of organic brain disorder or psychotic disorder, and a history of psychologic treatment during the preceding six months. Inclusion Criteria: Musculoskeletal pain for greater than 3 months. Exclusion Criteria: Prisoner status, cognitive impairment, lack of reliable transportation, or being pregnant. Participants Number of Patients: 24 Medical Condition/Type of Pain: Cancer Definition of Chronic Pain: No definition Baseline Pain Score: Global Quality Symptoms – Pain Intervention Group: 68.05 (SD 4.81); Control Group: 75 (SD 15.08) Mean Age: Treatment: 43.25 (SD 3.07); Control: 44.8 (SD 3.28) Gender (% Male): 0 Inclusion Criteria: Diagnosis of stages I, II, or III of breast cancer based on the clinical findings, cytological studies, and diagnosis of a physician; fatigue severity score higher than 4; duration of breast cancer greater than a month; no anemia; no other cancer diagnosis; age between 30 and 55 years; no other psychological treatment from the time of diagnosis; minimum of secondary school education; consent to participate; and ability to take part in the desired courses. Exclusion Criteria: Absence of more than two intervention sessions, not wanting to continue to participate in the intervention, and disease recurrence or development of metastasis elsewhere in the body during the study. Co-interventions: NA Inclusion Criteria: Women 18–70 years of age who currently had fibromyalgia, as defined by the Comparator: Passive (e.g., waitlist, no treatment); Active American College of Rheumatology criteria; control: muscle relaxation and stretching command of the German language and motivation to participate. Primary Endpoint: Pain Perception Scale Exclusion Criteria: Life-threatening diseases, evidence of suppressed immune functioning, or participation in other clinical trials. Inclusion Criteria: Type 1 or Type 2 diabetes for at least 1 year, diabetic neuropathy symptoms of pain and/or numbness for at least 6 months, male or female between the ages of 50 and 92 years, able to provide informed consent, and not currently practicing formal meditation. Definition of Chronic Pain: Other definition Baseline Pain Score: Headache severity Intervention Group: 4.4 (SD 1.11); Control Group: 4.8 (SD 1.33) Mean Age: Intervention: 45.9 (SD 17); Control: 45.2 (SD 12) Gender (% Male): 10.5 Inclusion Criteria: Diagnosis of migraine with or without aura (according to the International Classification of Headache Disorders-II); 4–14 migraine days per month; one-year history of migraines; at least 18 years old; able and willing to attend weekly sessions and willing to participate in daily mindfulness assignments of up to 30–45 minutes per day; agreeable to participate and to be randomized to either group; fluent in English; and in good general health with no additional diseases expected to interfere with the study. Exclusion Criteria: Current regular meditation/yoga practice; major systemic illness or unstable medical/psychiatric condition (e.g., suicide risk) requiring immediate treatment or that could compromise protocol adherence; medication overuse headache (according to the International Classification of Headache Disorders-II); current or planned pregnancy or breastfeeding; new prophylactic migraine medicine started within 4 weeks of the screening visit; unwilling to maintain stable migraine medication dosages; and failure to complete baseline headache logs. Inclusion Criteria: Age between 18 and 65 years; the presence of chronic pain, which had persisted for at least 3 months at the moderate-to-severe level (i.e., at least 4 of 10 on an 11-point Numerical Rating Scale pain score); agreement by the participant not to receive other new treatments during the intervention, including the use of new medication, topical treatment, medication or other over-thecounter medication, or other nonpharmacological treatment; ability to give a written consent. Exclusion Criteria: Receiving concurrent treatment with therapies other than medications for pain or psychological symptoms; having a known, concurrent doctor-diagnosed Diagnostic and Statistical Manual of Mental Disorders-IV Axis I disorder; having previously participated in an MBSR program; having been engaged, currently or previously, in the practice of meditation or relaxation techniques, including an MBSR program; being illiterate, as the participant would not be able to complete the meditation diary. Primary Endpoint: Pain reduction Inclusion Criteria: Aged 18 to 65 years, with any chronic pain for at least 3 months. The pain had to Power Calculation: No be moderate to severe (scoring at least 4 out of 10 in an 11-point Numeric Rating Scale) verified by a trained research assistant and confirmed by a family physician. Exclusion Criteria: Received concurrent treatment other than medications for pain or psychological symptoms; had a concurrent Diagnostic and Statistical Manual of Mental Disorders Axis-I diagnosis; participated in an MBSR group, engaged in current or prior practice of meditation or relaxation techniques, including MBSR; were illiterate and unable to complete the meditation diary. Intervention Content of Intervention: Mindfulness meditation and emotion regulation therapy: Designed to develop two Location: United States or Canada Medical Condition/Type of Pain: Rheumatoid arthritis distinct sets of skills—one to reduce the negative impact of stressful life events and illness burdens, and the other Purpose: To investigate whether Definition of Chronic Pain: No definition to enhance the ability to sustain positive social cognitive behavioral therapy and engagements despite pain and stress. The treatment mindfulness interventions that Baseline Pain Score: Pain modules included (1) mindfulness and the bidimensional target responses to chronic stress, Intervention Group: 28.19 (SD 19.43); Control model of emotion; (2) mindfulness and awareness; (3) pain, and depression reduce pain Group: 34.31 (SD 18.07) emotional clarity and well-being; (4) acceptance, negative and improve the quality of thoughts, and reframing; (5) positive emotions and everyday life for adults with Mean Age: Men: 62.11; Women: 50.62 pleasant event scheduling; (6) enhanced social relations; rheumatoid arthritis (7) intimacy, stress, and mindfulness; and (8) Gender (% Male): 32 maintenance and generalization. Quality Rating: Good Inclusion Criteria: Described themselves as having Setting: Unclear rheumatoid arthritis at screening and could obtain a written confirmation of rheumatoid arthritis from their Dosage, Duration: 1–4 hours spent in session, homework, rheumatologist. and other each week, for 8 weeks Exclusion Criteria: Taking any cyclical estrogen replacement therapies; have Lupus. Reference Astin, J. A., B. M. Berman, B. Bausell, W. L. Lee, M. Hochberg, and K. L. Forys, “The Efficacy of Mindfulness Meditation Plus Qigong Movement Therapy in the Treatment of Fibromyalgia: A Randomized Controlled Trial,” Journal of Rheumatology, Vol. 30, No. 10, October 2003, pp. 2257–2262. Brown, C. A., and A. K. Jones, “Psychobiological Correlates of Improved Mental Health in Patients with Musculoskeletal Pain After a Mindfulness-Based Pain Management Program,” Clinical Journal of Pain, Vol. 29, No. 3, March 2013, pp. 233–244. Esmer, G., J. Blum, J. Rulf, and J. Pier, “Mindfulness-Based Stress Reduction for Failed Back Surgery Syndrome: A Randomized Controlled Trial,” Journal of the American Osteopathic Association, Vol. 110, No. 11, November 2010, pp. 646–652. Morone, N. E., B. L. Rollman, C. G. Moore, Q. Li, and D. K. Weiner, “A Mind-Body Program for Older Adults with Chronic Low Back Pain: Results of a Pilot Study,” Pain Medicine, Vol. 10, No. 8, November 2009, pp. 1395–1407. Plews-Ogan, M., J. E. Owens, M. Goodman, P. Wolfe, and J. Schorling, “A Pilot Study Evaluating Mindfulness-Based Stress Reduction and Massage for the Management of Chronic Pain,” Journal of General Internal Medicine, Vol. 20, No. 12, December 2005, pp. 1136–1138. Pradhan, E. K., M. Baumgarten, P. Langenberg, B. Handwerger, A. K. Gilpin, T. Magyari, M. C. Hochberg, and B. M. Berman, “Effect of Mindfulness-Based Stress Reduction in Rheumatoid Arthritis Patients,” Arthritis and Rheumatism, Vol. 57, 2007, pp. 1134–1142. Schmidt, S., P. Grossman, B. Schwarzer, S. Jena, J. Naumann, and H. Walach, “Treating Fibromyalgia with Mindfulness-Based Stress Reduction: Results from a 3-Armed Randomized Controlled Trial,” Pain, Vol. 152, No. 2, February 2011, pp. 361–369. Sephton, S. E., P. Salmon, I. “Weissbecker, C. Ulmer, A. Floyd, K. Hoover, and J. L. Studts, “Mindfulness Meditation Alleviates Depressive Symptoms in Women with Fibromyalgia: Results of a Randomized Clinical Trial,” Arthritis and Rheumatism, Vol. 57, 2007, pp. 77–85. Our review required pain outcome. This study focuses on depressive symptoms, psychological distress, well-being, and mindfulness. Our review required pain outcome. This study reported depressive symptoms. Reference Weissbecker, I., P. Salmon, J. L. Studts, A. R. Floyd, E. A. Dedert, and S. E. Sephton, “Mindfulness-Based Stress Reduction and Sense of Coherence Among Women with Fibromyalgia,” Journal of Clinical Psychology in Medical Settings, Vol. 9, No. 4, 2002, pp. 297–307. Wong, S. Y., F. W. Chan, R. L. Wong, M. C. Chu, Y. Y. Kitty Lam, S. W. Mercer, and S. H. Ma, “Comparing the Effectiveness of Mindfulness-Based Stress Reduction and Multidisciplinary Intervention Programs for Chronic Pain: A Randomized Comparative Trial,” Clinical Journal of Pain, Vol. 27, No. 8, October 2011, pp. 724–734. Zautra, A. J., M. C. Davis, J. W. Reich, P. Nicassario, H. Tennen, P. Finan, A. Kratz, B. Parrish, and M. R. Irwin, “Comparison of Cognitive Behavioral and Mindfulness Meditation Interventions on Adaptation to Rheumatoid Arthritis for Patients With and Without History of Recurrent Depression,” Journal of Consulting and Clinical Psychology, Vol. 76, No. 3, June 2008, pp. 408–421. If Excluded, Reason Design was not randomized. Misuse: Results from an Early-Stage Randomized Controlled Trial,” Journal of Consulting and Clinical Psychology, Vol. 82, No. 3, June 2014, pp. 448–459. Gaylord, S. A., O. S. Palsson, E. L. Garland, K. R. Faurot, R. S. Coble, J. D. Mann, W. Frey, K. Leniek, and W. E. Whitehead, “Mindfulness Training Reduces the Severity of Irritable Bowel Syndrome in Women: Results of a Randomized Controlled Trial,” American Journal of Gastroenterology, Vol. 106, No. 9, September 2011, pp. 1678–1688. Goleman, D. J., and G. E. Schwartz, “Meditation as an Intervention in Stress Reactivity,” Journal of Consulting and Clinical Psychology, Vol. 44, No. 3, June 1976, pp. 456–466. Goyal, M., S. Singh, E. M. Sibinga, N. F. Gould, A. Rowland-Seymour, R. Sharma, Z. Berger, D. Sleicher, D. D. Maron, H. M. Shihab, P. D. Ranasinghe, S. Linn, S. Saha, E. B. Bass, and J. A. Haythornthwaite, “Meditation Programs for Psychological Stress and Well-Being: A Systematic Review and Meta-Analysis,” JAMA Internal Medicine, Vol. 174, No. 3, Mar, 2014, pp. 357–368. Hamling, J., P. Lee, R. Weitkunat, and M. Ambuhl, “Facilitating Meta-Analyses by Deriving Relative Effect and Precision Estimates for Alternative Comparisons from a Set of Estimates Presented by Exposure Level or Disease Category,” Statistics in Medicine, Vol. 27, No. 7, March 30, 2008, pp. 954–970. Hartung, J., and G. Knapp, “A Refined Method for the Meta-Analysis of Controlled Clinical Trials with Binary Outcome,” Statistics in Medicine, Vol. 20, No. 24, December 30, 2001, pp. 3875–3889. Hartung, Joachim, “An Alternative Method for Meta-Analysis,” Biometrical Journal, Vol. 41, No. 8, 1999, pp. 901–916. Higgins, J., and S. Green, eds. Cochrane Handbook for Systematic Reviews of Interventions, Version 5.1.0, The Cochrane Collaboration, March 2011. IntHout, Joanna, John Ioannidis, and George Borm, “The Hartung-Knapp-Sidik-Jonkman Method for Random Effects Meta-Analysis Is Straightforward and Considerably Outperforms the Standard DerSimonian-Laird Method,” BMC Medical Research Methodology, Vol. 14, No. 1, 2014, p. 25. Kabat-Zinn, J., Coming to Our Senses: Healing Ourselves and the World Through Mindfulness, New York: Hyperion, 2005. Kabat-Zinn, J., L. Lipworth, and R. Burney, “The Clinical Use of Mindfulness Meditation for the Self-Regulation of Chronic Pain,” Journal of Behavioral Medicine, Vol. 8, No. 2, June 1985, pp. 163–190. Sidik, K., and J. N. Jonkman, “Robust Variance Estimation for Random Effects Meta-Analysis,” Computational Statistics & Data Analysis, Vol. 50, No. 12, 2006, pp. 3681–3701. Teixeira, E., “The effect of Mindfulness Meditation on Painful Diabetic Peripheral Neuropathy in Adults Older Than 50 Years,” Holistic Nursing Practice, Vol. 24, No. 5, September– October 2010, pp. 277–283. Toblin, R. L., P. J. Quartana, L. A. Riviere, K. C. Walper, and C. W. Hoge, “Chronic Pain and Opioid Use in US Soldiers After Combat Deployment,” JAMA Internal Medicine, Vol. 174, No. 8, August 2014, pp. 1400–1401. U.S. Preventive Services Task Force, U.S. Preventive Services Task Force Procedure Manual, Rockville, Md. : Agency for Healthcare Research and Quality, 2008. Wells, R. E., R. Burch, R. H. Paulsen, P. M. Wayne, T. T. Houle, and E. Loder, “Meditation for Migraines: A Pilot Randomized Controlled Trial,” Headache, Vol. 54, No. 9, October 2014, pp. 1484–1495. Wong, S. Y., “Effect of Mindfulness-Based Stress Reduction Programme on Pain and Quality of Life in Chronic Pain Patients: A Randomised Controlled Clinical Trial,” Hong Kong Medical Journal. Xianggang Yi Xue Za Zhi, Vol. 15, Suppl. 6, October 2009, pp. 13–14. Wong, S. Y., F. W. Chan, R. L. Wong, M. C. Chu, Y. Y. Kitty Lam, S. W. Mercer, and S. H. Ma, “Comparing the Effectiveness of Mindfulness-Based Stress Reduction and Multidisciplinary Intervention Programs for Chronic Pain: A Randomized Comparative Trial,” Clinical Journal of Pain, Vol. 27, No. 8, October 2011, pp. 724–734. Zautra, A. J., M. C. Davis, J. W. Reich, P. Nicassario, H. Tennen, P. Finan, A. Kratz, B. Parrish, and M. R. Irwin, “Comparison of Cognitive Behavioral and Mindfulness Meditation Interventions on Adaptation to Rheumatoid Arthritis for Patients With and Without History of Recurrent Depression,” Journal of Consulting and Clinical Psychology, Vol. 76, No. 3, June 2008, pp. 408–421. 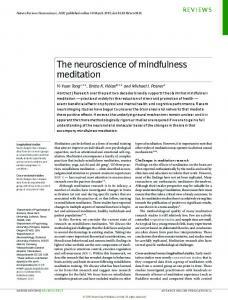 Report "Mindfulness Meditation for Chronic Pain"